What is your favourite part of being a tour guide? I get to show my guests around some of my favourite places, I meet lots of really nice people, I’m out and about all day and no two days are the same. The best thing though, I think, is the sheer joy evident when my guests see something really amazing – I get a real buzz out of that. What’s your TOP place to explore? I don’t think I could name one favourite place – different places are special for different reasons. 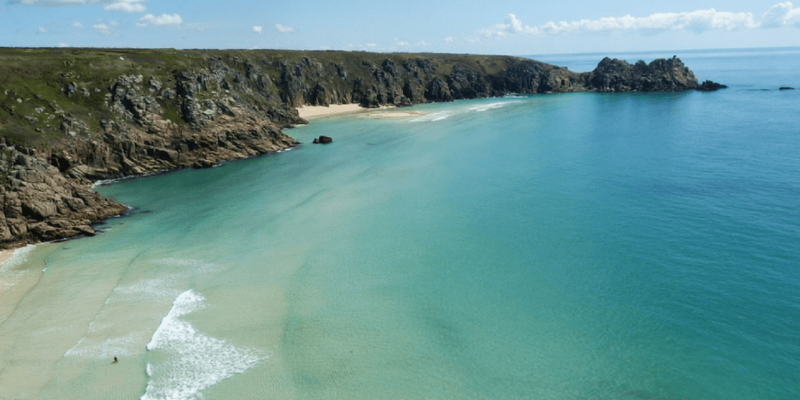 The spirituality of St-Just-in-Roseland, the fascination with the Shipwreck & Heritage Centre in Charlestown, the beauty of Porthcurno with the Minack Theatre and the Telegraph Museum, the bleakness and breath-taking scenery of Bodmin Moor. I love going around them all and I find something new with each visit. I’ll never get tired of any of them. 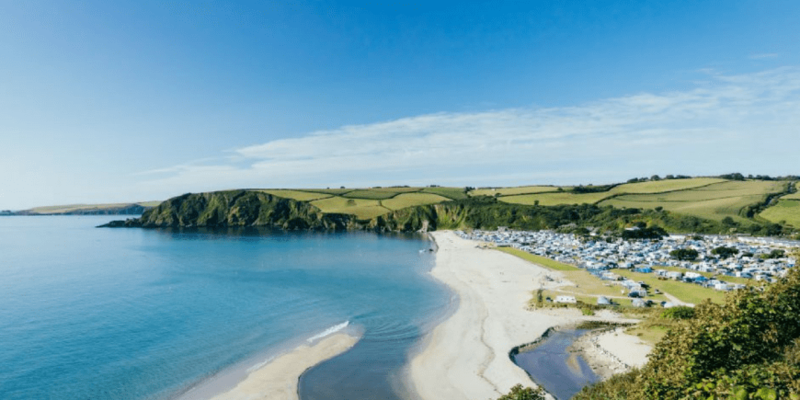 What makes Cornwall so special? How long have you got? Cornwall is unique – not just in the UK but in the world. It manages to combine a rural environment with an industrial heritage and scenery that’s like nowhere else on earth. The foodies have discovered that Cornish produce is without parallel – we could have told them that years ago! Our climate is special as well. We get spring before the rest of the country! The Cornish people have a definite identity which sets them apart from the denizens of the rest of the UK and I really hope that the Cornish language makes the comeback that appears imminent. As a kid I used to read lots of historical novels by the likes of Rosemary Sutcliff and Henry Treece. They wrote a lot about our distant ancestors – the people who were around before Stonehenge. When I arrived in Cornwall two days after my seventeenth birthday I immediately felt the presence of those ancestors – history permeates every stone, brick and blade of grass in the Duchy. As I got to know my way around I could feel the weight of the past everywhere, whether from neolithic times with all the burial mounds and ancient monuments, or our maritime heritage with our historic harbours and coastline, or our industrial history with the mining and clay infrastructure that is still so much in evidence. I still feel that weight today, forty-odd years later and it is what I love most about Cornwall. Another “how long is a piece of string” question! It rather depends on how long your visit is. If only a short time is available then I would say that the Minack Theatre, St Michael’s Mount, St Ives and a walk around the moors are all essential as iconic Cornish experiences. Where is your favourite ‘hidden’ spot? When I think of a “hidden” spot I think of a place that is not well publicised or signposted. 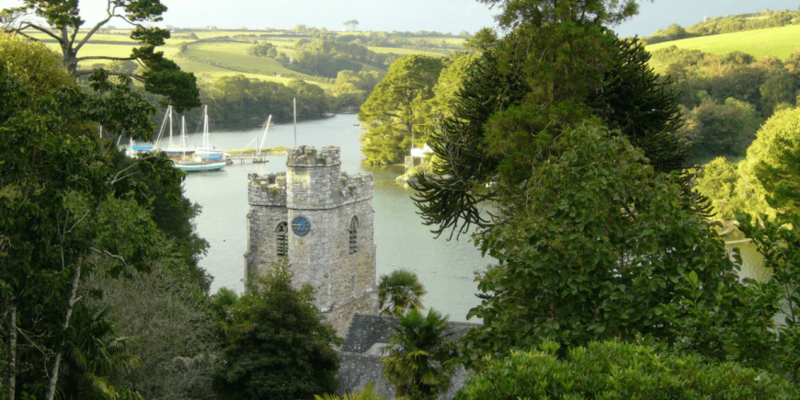 There are plenty of those about but my absolute favourite is the church at St-Just-in-Roseland. Not far off the Truro to St Mawes road, it’s tucked away in its own little valley and has its own micro-climate too. It is surrounded by beautiful grounds with plants and trees collected from around the world in the 19th century. It is positively steeped in history – the present building dates back to the 12th century and was a place of worship long before that. The whole of the valley is a tranquil, quiet place ideal for calm and peaceful contemplation. Just don’t expect that when there is a wedding taking place! Where is the most ‘off the beaten track’ place you’ve been to? I specialise in going off the beaten track – by definition where few other people go – and one of the places no-one seems to know about is, would you believe, only about half an hour’s walk from my house. Up on a hill above Threthurgy is a stone circle. It is not marked on Ordnance Survey maps – it is approached by means of one of the clay trails and then a hike up a steep hill. 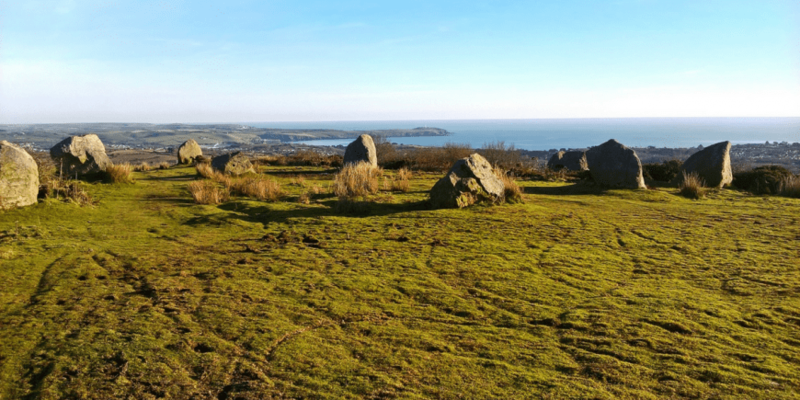 At the top is the circle and the whole thing offers a panoramic view of the whole of St Austell bay on one side and the workings of the clay county on the other. I just wish I could find out a bit more about it. What’s your top beach to go to? That is a difficult question to answer as there are a few that immediately spring to mind. For ease of access it would probably be Carne Beach. A bit of a drive to get to but there is decent parking and lots of beach for not many people. For close proximity then Pentewan Sands is good, plus there is the Ship Inn for when hunger or thirst raise their heads. The one nearest to my heart is Whitsands Bay. Three miles of sand at the base of high cliffs, it is the beach that loomed large in my summers as a callow youth. Every time I drive past, it brings a flood of warm memories. Good luck finding me when I’m not at work! Although I appear to be as skinny as a rake, I do in fact love my food and we tend to eat out a lot. We either visit one of our favourite restaurants or, purely for research purposes, we try out new places – just so I know if they are good enough for our guests, of course! I’m a fair weather hiker so if the weather is good – and the ground not muddy – I might go along a bit of the coastal path or head up to Cardinham Moor for a mooch around my old stomping grounds. I also potter around the garden a little bit, making the weeds look a bit tidier – although I much prefer tackling a pint on the patio. I also do research for future tours so, all in all, I don’t get much opportunity for being found when I’m not working. 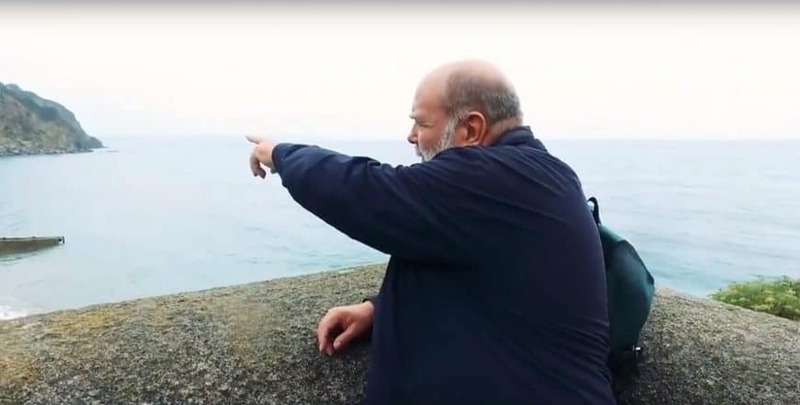 You can find more information about Keith and his Cornish Tours by clicking here.